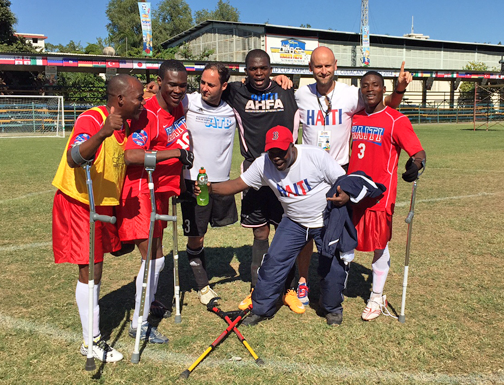 Haiti played with amazing speed to take control of their first game at the 2014 World Cup of Amputee Football (soccer) and beat Germany 2-0. They demonstrated enough firepower to be considered among the top teams of the tournament. The game was decided in the first half, with two top notch goals. The first goal came at the eleven minutes on a free kick by Francois Makendy and nine minutes later Lousiene Sandy sealed the game. Here the team is pictured at DFW International Airport. 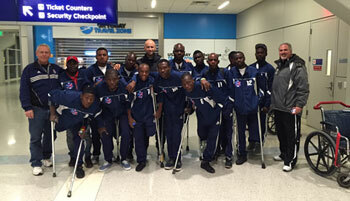 The Haiti National Amputee Football (soccer) Team arrived in Dallas, TX, on midnight, November 13, 2014, to begin final preparations for the 2014 Mexico World Cup of Amputee Football.